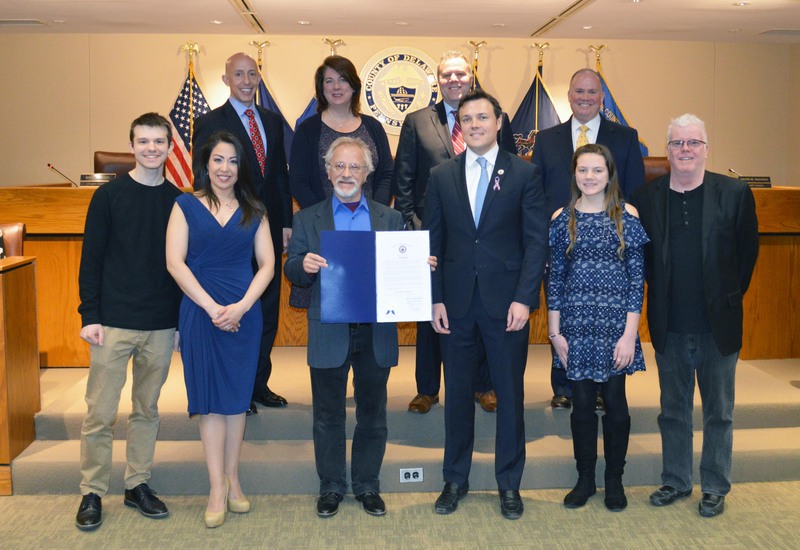 Delaware County Council recognized the 25th anniversary of the Media Theater during the March 20 council meeting. Since the curtain first went up on “My Fair Lady” in 1994, the Media Theater has shared the joy of live theatre with Delaware County residents and visitors. The musicals inspire, educate and enhance the lives of residents from across the region. In addition, the theatre nurtures creativity through its classes, camps and special programs for all ages, children to senior citizens. On March 30, The Media Theatre marquee will illuminate State Street in Media as the award-winning professional music theatre celebrates its 25th anniversary. The Silver Anniversary is the theme for the music theatre company’s annual gala, its biggest fundraiser of the year. The Media Theatre was originally constructed in 1927 as a vaudeville house, featuring short live acts. In 1993, Walter Strine Sr. of Media Real Estate purchased the theatre and undertook a massive renovation of over $1 million to restore the theatre to its former aesthetic glory. He had the vision to renovate the historic movie house as a live performing arts center and chose “My Fair Lady” as the first production in honor of his wife, Elizabeth. In 2003, Mr. Strine sold the historic Media Theatre with a combination of State and local grants to the Borough of Media. In 2000, as the company became a non-profit, Cline created and established Camp Media Theatre, a summer day camp learning experience for children and teens. The theatre camp nurtures creativity and fosters a love for the arts from a young age.